The new Android malware continues to rise, the high penetration of smartphones with Google’s operating system has boosted the interest of hackers for this platform. So it is important to take precautions. Today we met a new malware called Loozfon that target to infect women users. 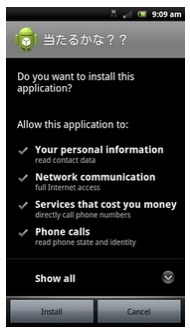 Japan is the country that has warned Loozfon proliferation, a virus that has been designed to attract users with Android. Unlike other threats that are distributed as applications in unofficial markets, this new virus arrives via email and hook used as a false promise to find a rich man in a short time. The email reports a new browser for Android that lets you find men with money following the preferences of users, those who click on the URL to download and install the application automatically become infected. Explains RedesZone once Loozfon is installed on the phone, starts a countdown in which the malware collects contacts, emails and phone numbers that are sent to a remote server to feed the giant Spam databases. When the user realizes that the application is actually a virus, the phone contact has been clean and the only solution is to start from scratch. While security companies have developed solutions to protect smartphones, the best protection is the passive safety of the user. Actions like disable Bluetooth not connect to WiFi networks accepting unsafe or dubious applications are basic tips that can help to protect your computer. We recall that all malware created for economic aims, collect personal data, send premium SMS or unauthorized calls premium numbers.